Welcome to another Best For Mums product guides, the website run by parents for parents. If you’re looking to make your nursery, bedroom or home more sleeping friendly then blackout blinds are a way to do that. What are the benefits of using blackout blinds? Does my baby’s room need blackout blinds? Here are 10 of the best blackout blinds and curtains for different scenarios. From finding the perfect blackout curtain to match your baby’s beautifully decorated nursery, to purchasing a portable blind to take with you on holiday. We have selected a wide range for all of your baby blackout needs. The Deconovo Blackout curtains are a perfect addition to your nursery: they come in a range of colours and sizes and use triple weave technology to ensure total darkness as well as noise reduction. 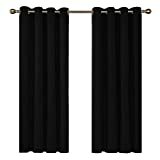 These thermal blackout curtains will not only darken your nursery and eliminate all light from disturbing your little one’s sleep but they help to cool the room during hot summers and save on hearing costs in the winter but keeping the cold out. Available in pink, blue, black, white and grey- you’ll easily find a pair of the eyelet blackout curtains that suit your baby’s nursery perfectly. The perfect blackout curtains for your baby’s room. READY MADE:Two Panels Per Package, Each panel measures 117 x 138cm Drop, Inner Diameter of the Each Ring Measures 4cm. MATERIAL: These thermal eyelet blackout curtains are made of 100 percent polyester and are imported. ENERGY SAVING: Deconovo thermal eyelet blackout curtains will darken your rooms, keep light out and cool homes during hot summers and save on heating costs by keeping the cold out during the winter months. NOISE REDUCTION: Bedroom blackout curtains ensure that even if you are a light sleeper you will not be disturbed by the outside world. They will stop the outside world from creeping into your private moments so you can enjoy the privacy with family members and friends to the utmost. 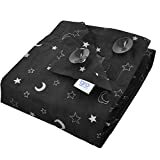 This thermal roller blind from Amazon helps to block out light from your baby’s room to allow for falling asleep earlier and waking later during the lighter months. The blackout blind is 150cm in length with a variety of width sizes to choose from which can be cut to size for the perfect fit. The blind’s thermal coating will also help support your homes existing heating and cooling systems which is ideal for the nursery. You can effortlessly raise or lower the blind by pulling on its sturdy cord. As roller blinds go, this is easy to install and uninstall, with a simple clipping system that attaches directly to the window so no drilling is required. The blind comes in a range of colours to suit your baby’s room. An excellent choose if you’ve already purchased curtains that aren’t blackout or you’re choosing not to have curtains up in the room. As the name suggests, this is the perfect blackout blind to take anywhere. From the nursery to taking on holiday with you: this blind will be perfect to take with you and allow for your baby to nap and sleep in complete darkness. Each side of the blind contains Velcro and suckers all the way along- allowing you to modify the size of the blind to fit your window perfectly. The blind arrives in a handy storage bag which is ideal if you are folding it away and taking it with you. What’s more, it weighs just 200g making it ideal for holidays abroad. The Gro company offer a complete guide on how to best attach and store your Gro Anywhere Blackout blind so you’ll be able to make full use of the blind straightaway. This blackout blind is an excellent portable blackout blind that you can use at home or away. The use of tiny suckers and stretchy sides allow for the blind to be used on any window up to 140 x 200 cm without the need for adhesives or tools. When you’re not using the blind, it flows away into a compact integrated pouch which you could easily fit into an overnight bag, suitcase or drawer until you next need the blind. Constructed from a thick and high quality blackout fabric this blind is of the same quality as a permanent blackout blind with the added bonus that you can take this one with you when you move to another room or go on holiday. This is a great purchase if you’re baby will be sleeping in your room then moving into their own room as the blind can be moved across when the time comes for the transition. 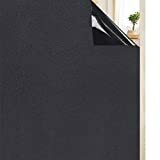 The Magic Blackout Blind is a really simple and effective way to quickly black out a room without the need for tools or adhesives. The pack contains 10 reusable blackout sheets (60 x 80 cm) on a roll that you can cut to size if required. The sheet then sticks directly onto the window using static cling and peels off without leaving marks. This blackout blind is perfect if you are travelling with a baby- you can quickly and easily block out all light in the room without it being a permanent fixture. If your baby is used to sleeping in a blacked out room at home then these are essential to ensuring some good naps and sleeps while you’re away. Negative reviews appear to be from buyers that have bought this as a permanent fixture for the baby nursery but if you’re looking for a temporary blackout blind for when travelling or visiting friends/family then we highly recommend the Magic Blackout Blind. If you’ve already purchased curtains you love then why not attached these blackout liners to them to create your own blackout curtains? 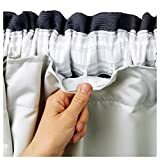 Simply attach the blackout lining to your curtains using hooks to block out daylight instantly without having to get rid of your existing curtains. You will receive two curtain panels to attach to your curtains with a range of sizes to choose from. These are an excellent choice if you have purchased curtains but there’s too much light coming in which is disturbing your little one. Simply attach the blackout lining to your curtains and you’re little one should be sleeping better in no time… fingers crossed! Size: 66" Width x 72" Length | Each packet contains 2 curtain panels. Drop is 2" Less than stated so Linings DO NOT hang below the curtains. The Rabbitgoo blackout window film has been designed to block out almost all external light. The window film fits onto your window and can be cut to size to ensure the film will fit perfectly. The film comes in a 3 different size and a colour choice of black or white to suit your room. The film is easy to apply: cut the film to size, clean the window, wet the area, peel off the backing film, apply the film to the surface and use a cloth to smooth out any bubbles. This is not a blind to be taken down and put back up- it may be ideal if you have a smaller window in the nursery preventing total blackout and you’d like to eliminate the light from it on a more permanent basis until your baby is older. 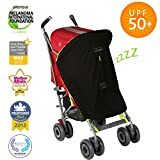 The SnoozeShade for prams is a sunshade and blackout blind that will allow your baby to safely be in complete darkness in the day when out for a walk. This is ideal if you are going on a walk at the time your baby would usually nap and you don’t want them to miss out. It’s a sunshade that also protects your baby from wind, chill, insects, light rain and unwanted distractions of people popping their head in to say hello… One of the benefits is that if your baby falls asleep whilst out with the SnoozeShade on, they’re more likely to stay asleep once you return home until they wake naturally because of the blackout environment. If used regularly, your baby will start to associate the SnoozeShade on their pram with their nap time which will really help your routine. 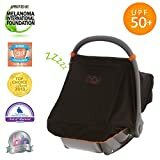 The SnoozeShade for infant car seats is a sunshade and sleep aid which has been designed to not only provide a dark sleeping environment for you baby but also to protect them from the sun. The canopy is made from soft, stretchy, breathable fabric to block light and other distractions to allow your baby to nap in the day whilst out. The blackout car seat cover is really easy to attach to any car seat. If your baby is used to napping and sleeping in a blackout environment then this is essential for ensuring a peaceful nap for your little one whilst allowing you to get out at the same time. Our final recommendation isn’t a blackout blind as such, but it will certainly make travelling with little ones in the car so much easier and hopefully more peaceful. 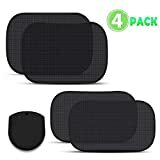 The Akeekah Car sun shade wind screens come as a pack of 4 and easily attach to your window to minimise light and stop the sun’s glare impacting your baby or little one. These are really easy to attach: simply unfold the car blinds and press it down. Of course you cannot create a complete blackout in your car, but these car window shades will help minimise light disturbances for your baby and hopefully help them to settle. WHAT YOU GET- Included in this set are 4 sun shades for car windows. Also included are two free bonus gifts worth £10 - a microfibre cloth to clean your windows, and a carry case. HIGH QUALITY PROTECTION - We use premium 80GSM protective mesh, which blocks up to 98% of rays. This ensures that you can protect your children, pets and the rest of the family from glaring sunlight, extreme heat, and harmful UVA / UVB. EASY & CONVENIENT, NO MESS - The 15S static cling material means no ugly & messy suction cups. Simply press down to secure the car sun shade. The baby shade can easily be twisted into a small circle for easy storage and transport. In conclusion, the benefits of a blackout environment for your baby’s sleep are huge: it eliminates light distractions, puts you in control of bedtime and naps and ensures consistency for your baby which can help when getting your baby to sleep in new or unfamiliar places. There are so many products available from blackout blinds and curtains to blackout covers for your car seat and pram. We hope you find the products you need to create the perfect environment for your baby. Blackout blinds and curtains are made using a thick opaque material that does not allow any light to travel through. Most commonly, blackout blinds are used in hotels, by shift workers and most commonly in baby nurseries. The aim of using blackout blinds and curtains is to eliminate all light from entering the room and thus allow for a better nights sleep without light disturbances from street lamps or the early sunrise in the summer months. Blackout blinds and curtains will eliminate all outside light from entering the room- therefore the main benefit is that the room will be in complete darkness regardless of the light levels outside. This means that if a streetlight comes on, car lights are passing and flashing, or the sun rises then from the inside you would be unaware. Additionally, blackout blinds can assist with noise reduction in the room which is an added bonus when trying to get your little one to sleep. Blackout blinds also help to maintain the temperature of the room which is great for your energy bills but also to help keep the optimal temperature for your little one to get to sleep. In our opinion, blackout blinds are an essential purchase when it comes to preparing your house or nursery for a baby. They will allow you to have more control over your baby’s sleep routine and pattern and minimise the risk of disturbances from outside. They will also allow your baby to nap during the day much better than in a light room. Blackout curtains are also really helpful if your baby will be sleeping in different rooms (transitioning from your room to their own) or perhaps staying with relatives or travelling on holiday with you as they allow for consistency. Your baby can get used to falling asleep in darkness then they will feel more comfortable doing so when not in their own room.